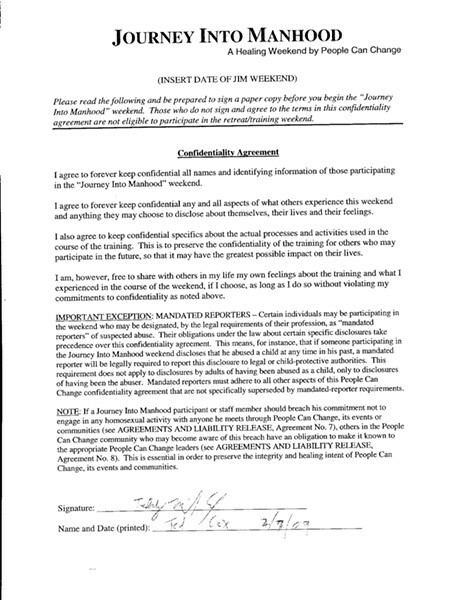 Upon learning of Cox’s story proposal, JiM founder and life coach Rich Wyler quickly intervened, urging City Weekly not to run Cox’s story because Cox signed a confidentiality agreement barring him from speaking about the weekend. City Weekly decided not to publish Cox’s proposed story but rather to ask Cox why he went undercover to get the story. Why so much interest in reparative-therapy programs? This started in 2007, after I saw a segment on the Daily Show where the correspondent interviewed Richard Cohen, who is a pretty infamous ex-gay therapist, and I was surprised … that they didn’t at all delve into the religious motivation behind the ex-gay movement. I found local ministries, and I’ve attended different support groups. I’ve also gone to a couple of conferences that deal with the ex-gay movement. All of it is a look of what is going on, who goes to these things, and do they work—which is, of course, the really big question. In looking at the JiM Website (PeopleCanChange.com), it seems the men who attend are sharing their feelings at a deep level. Yet, you were never honest about who you were. Why? I also opened up at that weekend. I revealed things about myself that I don’t go around telling people, things about my childhood. The reason I did that was so I could understand what it’s like to go through that process. Granted, I do not understand what it’s like to be a gay man with a Christian background who is trying desperately to change who he is because he believes if he acts on these desires, he is committing some horrible sin. But, I went through the process. And the reason you have to go undercover is because there is no other way to find out what’s going on. These organizations cloud themselves with secrecy; everything is hidden—it’s blocked; it’s behind confidentiality agreements. 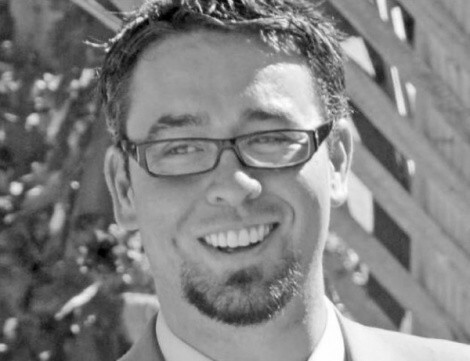 How do we know if what Wyler is doing is ethical unless someone can take a look at it and critique it? 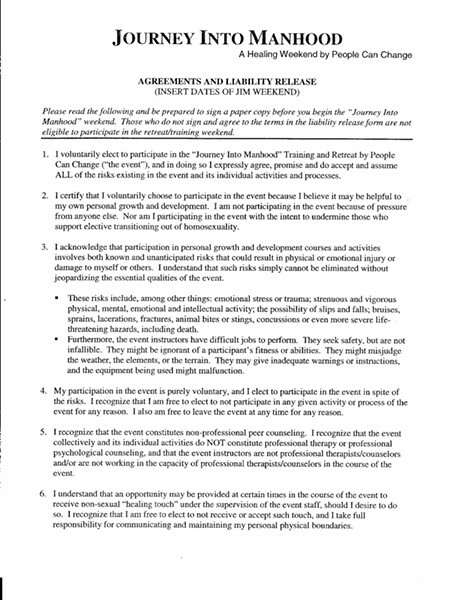 Note: Rich Wyler would only consent to be interviewed if any reference of Ted Cox attending the JiM seminar undercover was “scrubbed.” Copies of Cox’s signed confidentiality agreement can be seen below.